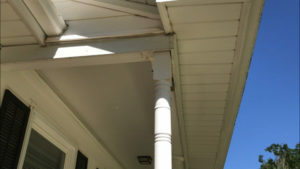 Replacing porch columns is actually a very straightforward task with the right tools. 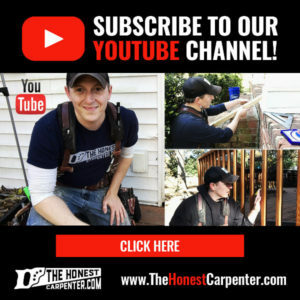 This short article and video will show you how to remove old columns, cut new ones to length and install them safely. Just remember: replacing structural components in your home can be very dangerous! Always consult a professional carpenter or contractor, and a structural engineer, before attempting to tackle the project on your own. 12″ MITER SAWS are even better than circular saws for making clean cuts on large posts! 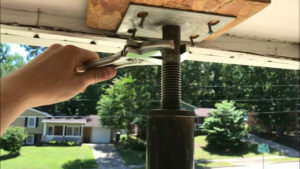 The key to making your porch column replacement go smoothly is using a tool known as a “post jack”–or a “jack post.” These adjustable tubular poles are capable of lifting extraordinary amounts of weight, up to 18,000 lbs in some cases! 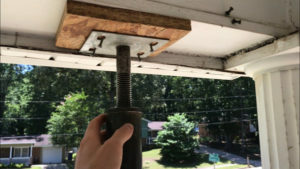 By using the carefully positioned post jack to temporarily lift the weight of the roof, the old porch column can be safely pulled out and a new one installed. Post jacks come in a variety of sizes, but for this job you will need one that extends to just over 8′, similar to the one I use below. Fully extended post jack positioned beneath the porch roof beam. 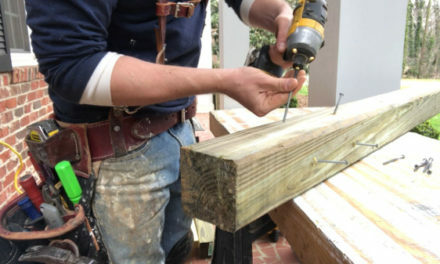 To install the post jack, you’ll need to first ensure that the tool has a clear place to sit. 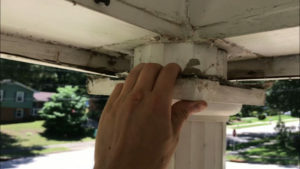 The area directly beneath the porch beam (the structural member that rests on the columns and carries some of the roof weight) must be free of obstructions. This includes railings, which are often directly in the way. The porch where I’m replacing columns in this article fortunately did not have any railings. (I would later install them when the new columns were in place.) However, if railings had existed on the porch, there’s a good chance I would have had to remove them before installing the jack. With the area free of obstructions, place a wooden block on the porch floor directly beneath the beam, and then place one of the steel jack plates on the center of it. Position protective wooden blocks above and below post jack. The wooden block helps prevent the jack from scarring the porch or breaking bricks. The steel plate gives the metal jack something extremely hard to sit on. You’ll want to use the two in combination at both ends of the jack. Fit the two jack poles together so that they are at an extended length that brings them within 5″ of the roof beam. They can then be pinned together by passing thick carriage bolts (included with jacks) through aligned holes in the walls of the pole. Thick carriage bolts keep the jack extended. 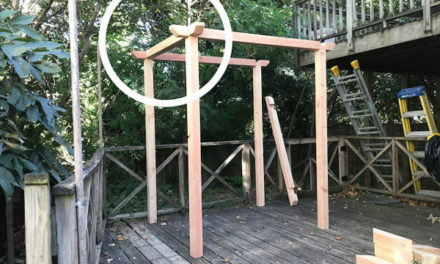 Finally, fit the “screw” into the upper end of the pole and wind it up or down so that it fits beneath the beam and the wooden block. Hand-tighten the screw (the only moving part in the tool) so that it lightly clamps itself in place. A knob on the top of the screw will fit into a circular hole on the steel plate. At this point, the jack is mostly installed, but is not carrying any real weight. Take the opportunity to plumb it up with a level. 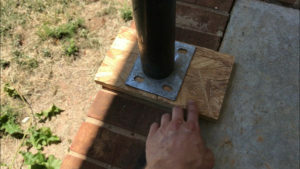 Use screws to secure the post plate to a protective wooden block. Turn the post jack screw with a large adjustable wrench. With the jack in place, use a large adjustable wrench to turn the screw. The jaws of the wrench can grip a flat, narrow section on the threadless neck of the screw shaft. Rotate the screw in quarter- or half-turns, but don’t go too quickly. In the end, we’re only going to lift the roof 1/4″ or less. You want to listen for creaks and pops that let you know that weight is being transferred. If the existing column has a decorative cap or collar, now is the time to pull it down to get a clear view of the top of the existing column. Pull down existing caps to see column top more clearly. In some cases, the cap will be sitting on the column, acting as a layer between the two. In these cases, you can essentially consider the cap to be the true top of the column itself. Either way, you want to begin looking for separation between the column and the underside of the beam. Jiggle the column with your hand in between half-turns. As the roof weight is lifted, the column will begin to turn easily. When you can see about an 1/8″ gap between the column and beam, full separation has most likely occurred. You should be able to “walk” the column out by rotating it back and forth. The column has been temporarily replaced by the post jack. If the column was toenailed into place, you may need to pull the bottom out first and gently pry the column free. Likewise, if the column was heavily caulked at the top, you may have to cut and chisel some caulk loose. Either way, you should be able to now fully remove the old column and set it aside. Often, there is nothing more than gravity and roof weight holding the porch columns in place! Measure from the porch to the underside of the beam. Standing on a stool or stepladder, drop the tab of your measuring tape onto the surface of the porch where the new column will sit. 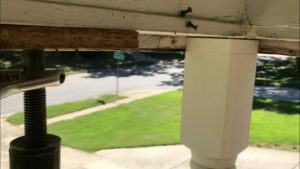 Pull up past the point where the top of the porch column will stand, and find the current height by sighting the tape where it crosses the beam. Given that the beam is momentarily lifted above its normal resting place, this measurement will actually be about 3/16″ longer than you need. 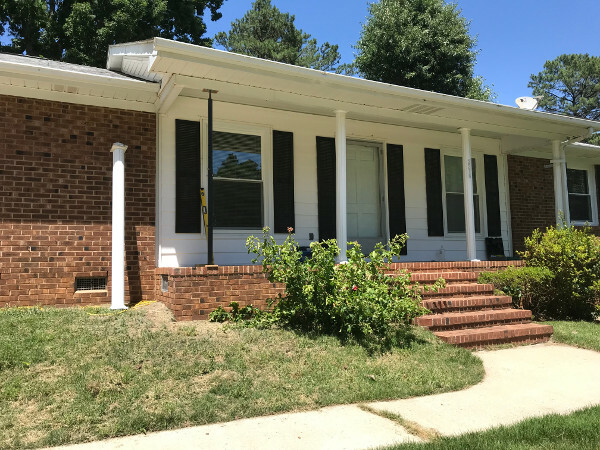 Shave off about 1/8″ for the final measurement–a difference of 1/16″ won’t matter, or will even give the new porch column a little room to get settled. Cut the new column with a circular saw and speed square. In this project I was cutting a wooden “colonial” style post, which has square walls with a turned section in the center. 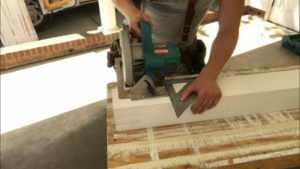 Metal or fiberglass columns may require other cutting techniques, but a circular saw or miter saw will work to cut porch columns similar to this one. Before you cut the column to your measured length, you’ll want to consider other factors that may affect the total height. 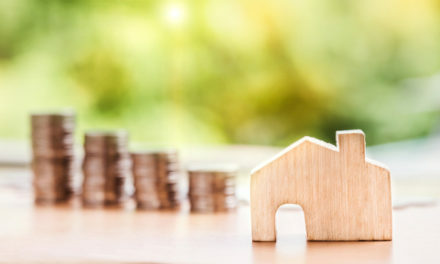 For instance, nearly all wooden porch columns should be installed on a “post base,” often a metal or plastic foot that keeps the column off of the porch surface, where it may come in contact with standing water. New 5″ wood porch column with plastic base. Most bases are 1/2″ thick. So, you’ll want to subtract 1/2″ from your total height measurement to account for this. 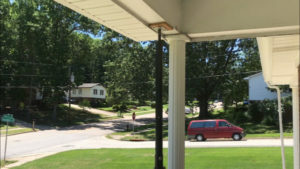 Also, if you’re going to attach railings that are the standard 36″-42″ inches tall, make sure that you’re leaving enough square section on the lower end of the post for the railings to meet. You may have to take some material off the top of the post, and the bottom of the post to account for this (as I did in this project). When you’ve made these considerations, though, just pull your measurement from the top of the porch column and mark your cut point. If you’re using a miter saw to cut the column, just cut straight the column precisely at this mark. 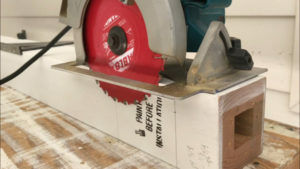 If you’re using a circular saw, then use a speed square to draw a control line all the way around the column at the measurement. Set the depth of your saw to cut all the way through the wall of column (pictured below). Set the circular saw blade depth to cut through the wall of the new column. 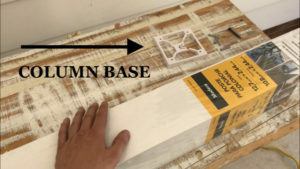 Use siliconized caulk to seal the bottom of the new column before installation. Wooden columns are prone to soaking up water and rotting out at the bottom. Therefore, you always want to seal the end grain before installing the column. 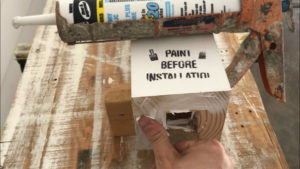 This column actually has printed instructions on it that say to “paint before installation.” I like to go a step farther by caulking the end grain with a siliconized caulk instead. Just smear appropriate exterior-grade siliconized caulk on the bottom end and rub it into the pores of the wood. 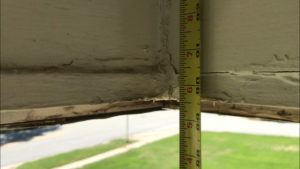 Also spread some up into the cavity of the porch column–a few inches if you can manage. Position the new porch column below the beam. Stand the new porch column in place and make sure that it fits the opening in the way you anticipated. Try to get it as near plumb as possible with a level. This can be tricky. Framers try to line up roof beams directly above the perimeter of a masonry porch like this, but it can be very hard to do so perfectly. The corner of the porch will often be slightly out of plumb with the beam above it. When inconsistencies like this occur, I try to find a balance between all of the factors. But I focus on structural value. It takes a lot of tweaking to get these factors right. I’ll often walk around and look at the porch column from multiple angles to be sure it doesn’t look too out of whack. But most importantly, it make sure it is centered directly beneath the beam and sitting fully on the porch. Release the post jack slowly to bring roof weight down onto the new column. Transfer the roof weight onto the new porch column by slowly removing the post jack. You can do this by simply reversing the process you used to install the jack. 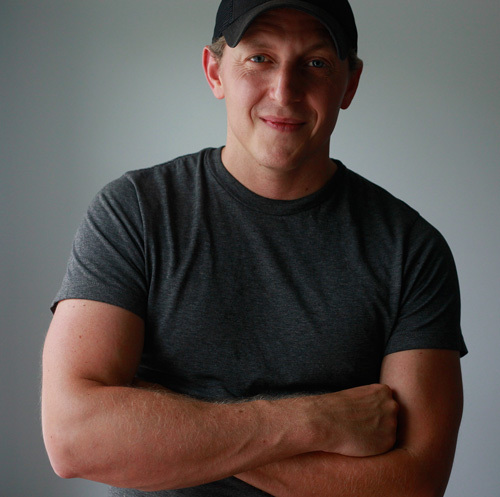 Use an adjustable wrench to turn the screw in the opposite direction. While you’re doing this, watch the gap diminish at top of the column. When contact between the beam and column is made, jiggle the column to feel that it is being pinned down. Watch the column for any signs of stress or movement as the full weight is transferred. When the weight is entirely on the column, the jack will become wobbly. Carefully remove it and set it aside. Toenail the top of the column into the beam with galvanized trim nails. Gravity should now be pinning the column down so heavily that it doesn’t want to budge. 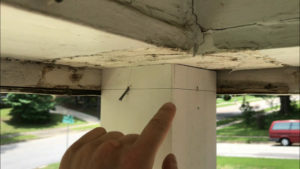 All the same, it can’t hurt to drive some galvanized trim nails through the top of the porch column up into the beam just to ensure it doesn’t twist. 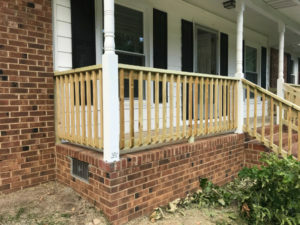 In this project, newly installed railings also made sure that the column couldn’t “kick out” or get pulled off the porch at the base. 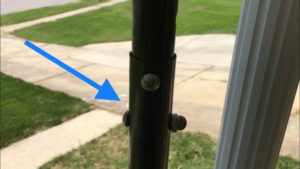 Many of the post bases come with some sort of mounting anchor–a screw that fastens the base into the porch to keep it from slipping sideways. But setting many of these anchors can often damage the masonry at the porch corner. If you’re concerned about the column slipping, consider instead running some high-yield masonry adhesive between the base and the porch. It will provide as much fastening power as the single screw anchor, and won’t damage masonry. If you’re installing your porch column on a wooden porch, you can also toenail through the base of the column with a very long screw. 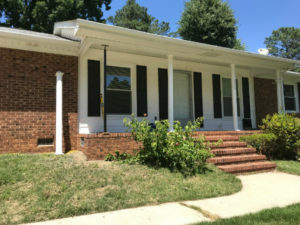 Overall, though, porch columns are not prone to moving. New railings attach directly to the new porch column. If you’re doing a series of porch column replacements (as I did in this project), you can go one at a time through them, carrying out this exact same process. Just remember: always consult a professional carpenter or contractor, and possibly a structural engineer, before tackling the project! Removing structural porch columns, though quite easy, can also be extremely dangerous. Safety is always the top priority in every construction project.